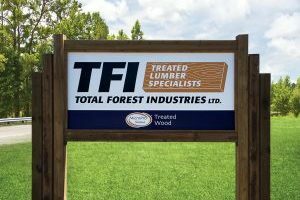 The Total Forest Industries Ltd. wood preservation plant is located on a 320-acre industrial property in Hagersville, 20 minutes southwest of Hamilton on Highway 6. 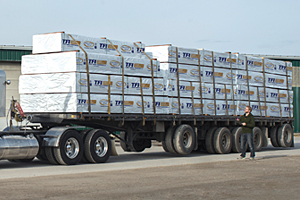 This strategically located site, coupled with excellent access to truck transport, allows TFI to get to market fast and support many of our customers’ just-in-time replenishment programs. All our manufacturing operations are housed indoors in a 40,000 square foot building. 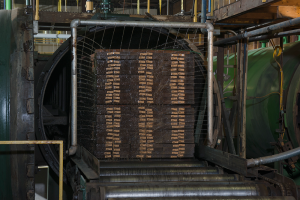 Wood moves through the TFI plant on conveyors and continuous chains. 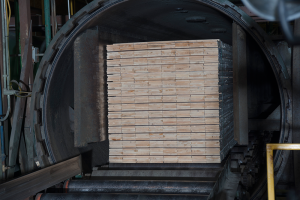 Our highly automated plant means that there are no lift trucks used to handle lumber products as they move through the preparation and treating lines. 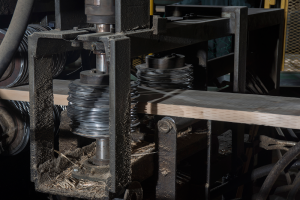 All wood, whether individual pieces or full lifts, is conveyed through our system on rollers and conveyors. Where appropriate, TFI incises wood before treatment with a GEN II fine-toothed incisor. This is especially important in products to be used in ground contact where meeting preservative penetration requirements can make a major difference in performance over the service life of a project. TFI’s automated stacking line produces compact, easy-to-handle lifts. This allows smaller retailers to carry a full product assortment with a smaller overall inventory investment. Dealers benefit from having better stock rotation and reduced footage of open lifts in their yard at any one time. All lifts have a 2×3 bunk strapped to the top for ease of handling and corner protectors on the lower edges. All products are end tagged with product dimensions and consumer safety information. 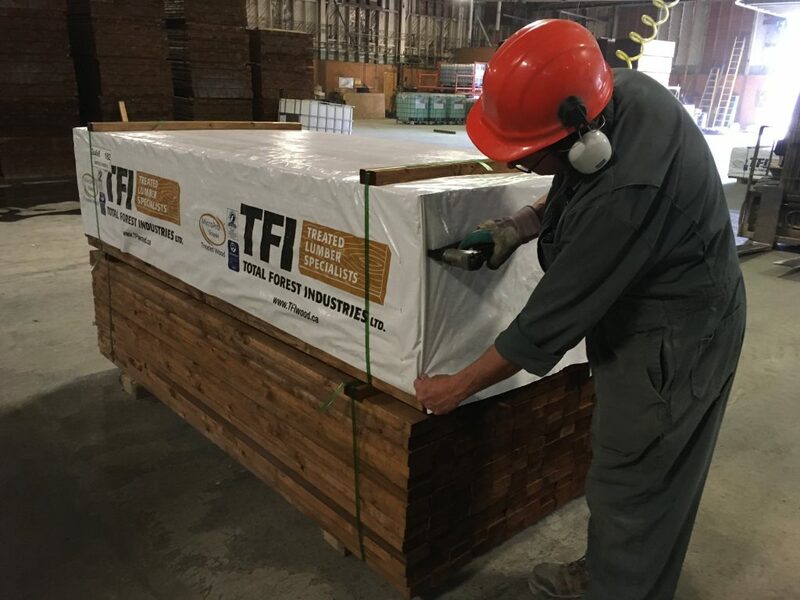 TFI is registered with the Electronic Commerce Council of Canada and can apply Bar Code labels on treated lumber for customers requiring them for automated check-outs. We have the capability to manufacture labels on-site. Our twin 7-foot diameter by 85-foot long pressure treating cylinders are incorporated into this continuous-flow manufacturing process for maximum efficiency. 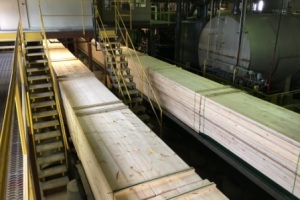 Each cylinder can hold approximately 17,000 board feet of lumber per “charge”, and each cycle takes between three and four hours depending on the species and size of the items being treated. Our treating cylinders are designed to operate at 200 PSI – the highest operating pressure of any treating plant in Canada – for maximum penetration and retention of the wood preservative. Preservative solutions are warmed by steam-fed heat exchangers during winter months, in order that we can achieve uniform production standards year-round. Our treating process control is fully computerized. Display screens provide real-time information about every step of the treatment cycle, and the system also stores a database about every charge treated and the results obtained. 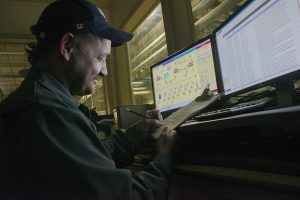 It also creates a log of running time for every pump and motor on the system, allowing us to schedule maintenance and avoid costly downtime. Other displays in the plant control room provide visual information of all plant activities, including conveyor and other operations on the lumber preparation line, door openings and closings and the status of all infeeds and outfeeds to the building. 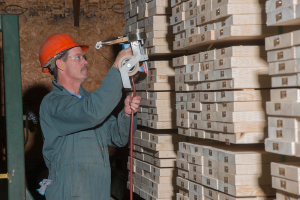 Each lift of lumber is power washed when it leaves the pressure cylinders after treatment. This dilutes any excess preservative solution still on the outside surfaces of the wood and avoids later problems that might otherwise occur due to unsightly staining on individual boards. Freshly treated material then moves to the primary drip area where the bundles are tilted and any remaining preservative solution is allowed to drain off and be recovered. 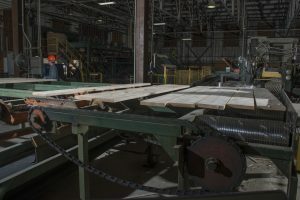 TFI was the first to design and install automated in-line tilting of whole conveyors in the wood preservation industry. Treated products are then rolled into our heated Finishing Building. This 13,000 square foot structure holds up to 500,000 board feet of freshly treated material. In this area final de-stickering and wrapping take place. By the time that lumber has completed its trip down the full length of the treating line, it has traveled a distance in excess of 500 feet! Total elapsed time ranges from 14 to 20 hours, depending on species and dimension. 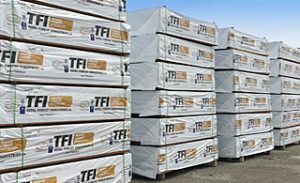 Not only does TFI produce a great looking lift of treated wood, we store our finished production in a well managed 15-acre compound. Every item TFI produces is available for immediate shipment. We can simultaneously load up to a dozen dedicated highway trailers.